Thirty years ago, I was driving along the A303 with one of my hippier friends, when he spied Stonehenge and begged me to stop so that he could smoke a joint in the presence of the ancient stones. He wanted to get ‘the special vibe of the place’. By the time I had wandered around the stones, he had finished puffing away and pronounced himself satisfied. When he finally woke up, near Honiton, my passenger announced that it had been the most blissful journey of his life. Passing the ancient henge when taking the same route this summer, I was reminded of him. He’s now a banker. However, this time, it was me who was in a state of unstressed elation driving a new Bentley Mulsanne, the brand’s flagship, as opposed to my old rusting brown Mini. How times change. Gliding along the road, happily deserted thanks to our early start, my delicately chilled seat was giving me a gentle massage; on the radio the Test Match Special crew was, in its own languid style, describing how the English cricket team was thrashing the Indian side. The children were watching a DVD and Mrs Hedges had been lulled to sleep by the sheer comfort of the great car. Heaven. This may be the pinnacle of luxury cars. I was fortunate enough to drive the Bentley Azure, the predecessor of the Mulsanne, to Switzerland and the Bentley Flying Spur to Scotland. The Azure was wonderful, but had a backside like a fishwife; the Flying Spur is a glossy speedster, which provided one hitchhiker with the shock of his life when we pulled over to give him a lift to Aviemore. 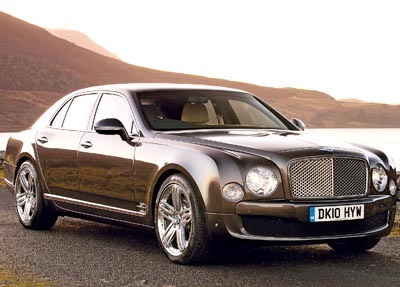 However, the Mulsanne is the best of the three. The coachbuilders have deliciously curved the remodelled backside of the Azure, and the brutish front of the car commands attention. It’s now as solid as it is exquisite. Inside, it’s traditional Bentley subtly updated to combine sumptuousness with advanced technology; wood with leather. Mr Toad would have loved the revamped 6¾-litre V8 engine, especially when you put your foot down. It produces effortless torque from extremely low revs -the epitome of a Bentley. It’s also quicker from 0-60mph than many so-called sports cars. Golly, it was fun to drive, whether gliding like a swan or hurtling across Britain like a dervish. However, the car faced a major challenge. Our destination was Constantine Bay on the north Cornish coast and, to be honest, I wasn’t sure how the giant vehicle would squeeze down the roads as they become thinner and twistier. But the Bentley was surprisingly nimble and the sensors ensured that we avoided any bump with wall or car. The car doesn’t show off, it’s just big and extremely well crafted. Taking nine weeks to build, only 800 Mulsannes will be built in any year. If I could afford one, I would definitely have one.